This is going to be part of a Christmas giveaway that I am taking part in on Monday. 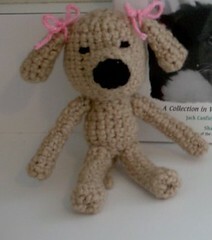 Rosie was made from the Mini Doggie pattern. I almost don’t want to give her up! I love the pink ribbons on her ears – nice touch! It is so cute! Love the dog.